TOKYO (AP) -- World financial markets took another plunge Thursday on concerns that the arrest of a senior official at Chinese telecoms equipment maker Huawei could hinder progress in China-U.S. trade talks. KEEPING SCORE: The DAX in Germany fell 2.4 percent to 10,933 and France's CAC 40 dropped 2.2 percent to 4,836. The FTSE 100 in Britain lost 2.2 percent to 6,767. U.S. futures also augured a downbeat start for Wall Street after markets were closed Wednesday to mourn the death of former President George H.W. Bush. The contract for the Dow lost 1.6 percent and that for the S&P 500 declined 1.5 percent. 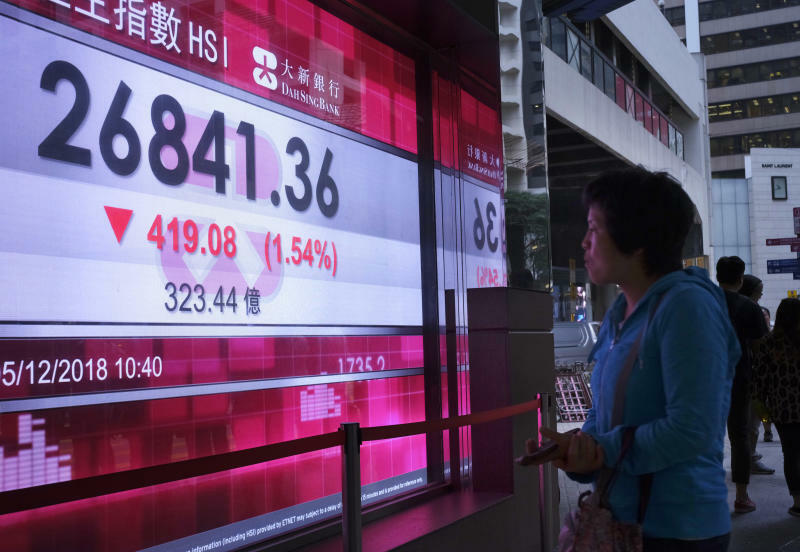 ASIA'S DAY: Hong Kong's Hang Seng index tumbled 2.5 percent to 26,156.38 and Japan's benchmark Nikkei 225 fell 1.9 percent to 21,501.62. Australia's S&P/ASX 200 lost 0.2 percent to 5,657.70, while South Korea's Kospi sank 1.6 percent to 2,068.69. The Shanghai Composite index dropped 1.7 percent to 2,605.18. Shares also fell in Taiwan and all other regional markets. HUAWEI: The news of Huawei CFO Meng Wanzhou's arrest sent shares sharply lower. Shares had rallied Monday following President Donald Trump's agreement with his Chinese counterpart Xi Jinping over the weekend to hold off on further retaliatory moves in a festering trade war. But they've since fallen back amid confusion over what the two sides agreed to and whether the deal will enable Beijing and Washington to resolve longstanding, profound differences over technology policy and other issues. China demanded Meng's immediate release. OPEC'S MOVE: OPEC countries gathered Thursday to find a way to support the falling price of oil, with analysts predicting the cartel and some key allies, like Russia, would agree to cut production by at least 1 million barrels per day. OPEC heavyweight Saudi Arabia indicated it was in favor of such a cut. The expectation did not keep the price of oil from falling, however, as investors focused on the potential economic disruption from any escalation in the U.S.-China trade war. Benchmark U.S. crude lost $1.45 to $51.44 a barrel in electronic trading on the New York Mercantile Exchange. Brent crude, used to price international oils, dropped $1.48 to $60.08 per barrel.